Casino Downtime Results in €24,000 in Casino Bonuses for Active Players During February! A great gesture from both Slotty Vegas Casino and BetAt Casino due to some technical issues last Friday 16th February which lasted until Saturday evening resulted in a long downtime for players. If you have been active at either of these casinos during February then you could be in line for a reward with €24,000 worth of casino bonuses to be rewarded to active players, basically €1,000 for every hour that the casinos were unavailable and this will be shared amongst the most active players at both casinos. So the first step if you have been playing at either of these casinos this month is to log in and see if you have a complimentary bonus waiting! If you have been active at either casino during February 2018 you will have a Complimentary 100% Deposit Match Bonus to claim until the end of the month. If you aren’t a member at either of these casinos yet then make sure to check out our article on both Slotty’s and BetAt’s Welcome Bonus structures to find out why their bonuses are some of the most player-friendly in the industry. And finally, there’s still plenty of other awesome promotions still running at both casinos during February which includes extra spins, cashback and more bonuses! 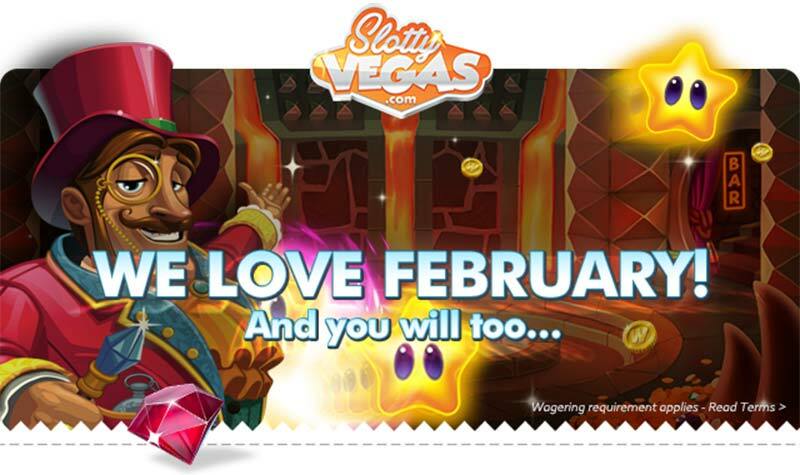 Firstly make sure you register at Slotty Vegas Casino then check out the schedule of casino promotions running each week in February. Weekly Bonus Reloads – A deposit match bonus each MONDAY throughout February, these vary each week and are generally in the range of 25% up to 100%. Wheel of Fortune – Every MONDAY, depositing will earn a spin on the Wheel of Fortune with up to 50 Super Spins or 100 Extra Spins on offer based on deposit amount and your luck on the wheel! Promo Codes – Every WEDNESDAY you will be able to use a special Promo Code when depositing to claim Super Spins or Extra Spins, the codes are only valid for 24hrs! Cashback – Every THURSDAY you can earn a very nice 25% cashback on losses if you decide to play Blackjack and Roulette at the casino, this is credited the next day. Weekend Warriors – A slot tournament running over the weekend (battle starts Friday at 19:00 CET) generally on a popular NetEnt slot, with a top prize of €500 and 50 runner-up places. All of the Terms and Conditions for these promotions can be found from the Slotty Vegas home page – click the large images to check out all of the different promotions and terms.